It felt like there wasn’t much to talk about last week. And to the surprise of no one, except the seller, the #153 lot has not sold. The unsaleable #153 trend continues this week in the Auction Watch too. 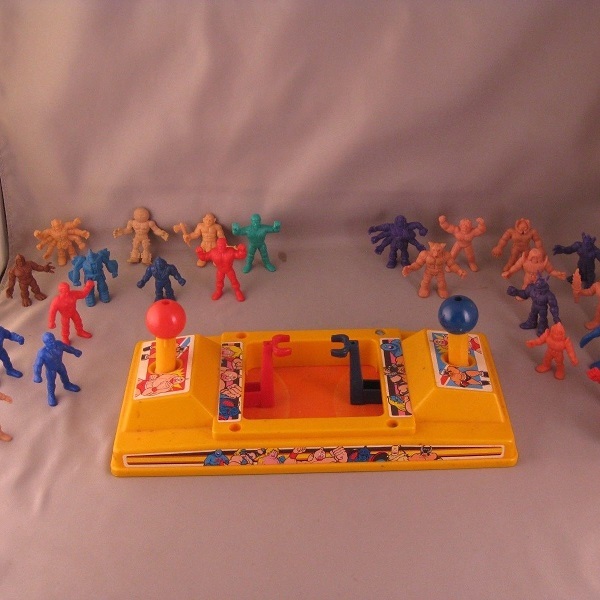 The first auction, Vintage M.U.S.C.L.E. 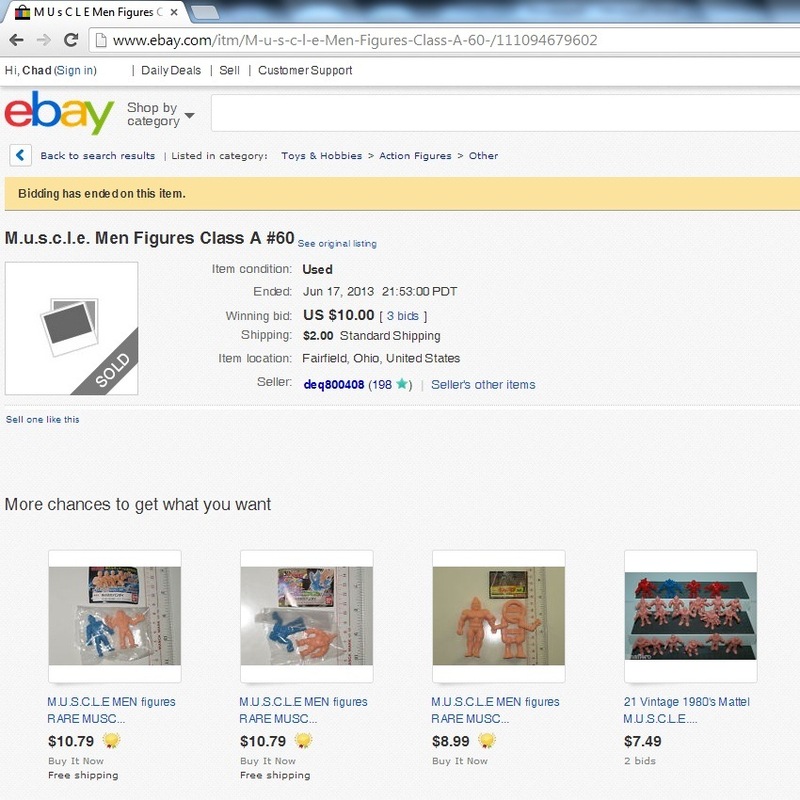 muscle men RARE Blue Claw 4pack, has a BIN of $386.81. The seller must believe that a #153 4-pack is priceless. I would argue that the seller is selling the wrong figure in the 4-pack. The Salmon #60 figure is a Class A figure. Of course, Class A is not a synonym for valuable – no matter how badly some people want that to be true. The last Salmon #60 Class A, that I can document, sold for $10 and that was five years ago! At, arguably, the height of macro-Class A madness. If this listing started at $0.99, then I don’t believe it could even get to $100 as a final price. That makes the $386.81 BIN very fun to me. I wouldn’t be surprised if we see this listing again in an AOTW tournament. COMPLETE SET of Authentic Vintage YSNT M.U.S.C.L.E. Men Flesh Figures #1- 235 ++yOU ALSO GET 2 NON POSTER Geronimo (Shouting), DR BOMBAY, and a 3rd random one i had. dont know anything about it. You get 238 total, and i printed out a checklist i will throw in too. only missing #236 out of the set. About 20 have minor flaws like marker or paint spots, discoloration, or scratches, but nothing serious. All others are in good to excellent condition! Does this guy really know the “#234 and #235” figures? Why mention the #236 figure? 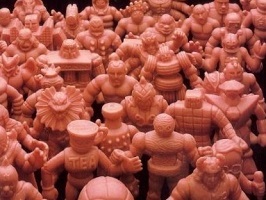 I think because she’s hoping you’ll be tricked into believing the Non-Poster keshi figures are authentic M.U.S.C.L.E. figures. 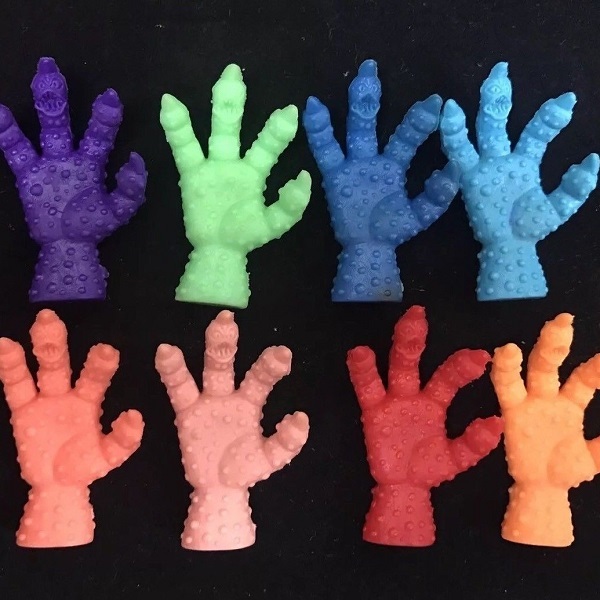 It would help someone swallow the $2.10 per-figure price. I don’t see anyone using the $495 BIN now or ever. 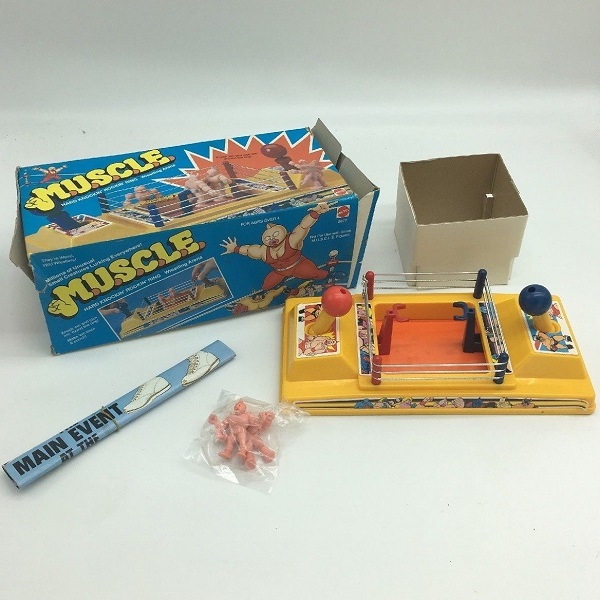 The third auction, 1985 MATTEL KINNIKUMAN MUSCLE MEN WRESTLING ARENA #2677 NEW OPEN BOX, features a BIN that isn’t quite as absurd. In fact, I nearly bought it. The $49 BIN doesn’t seem too awesome at first glance. It’s an open wrestling ring with the figures. The box isn’t even in that nice of condition. However, it has the white cardboard insert. I’m a sucker for that hyper-specific piece of ephemera. 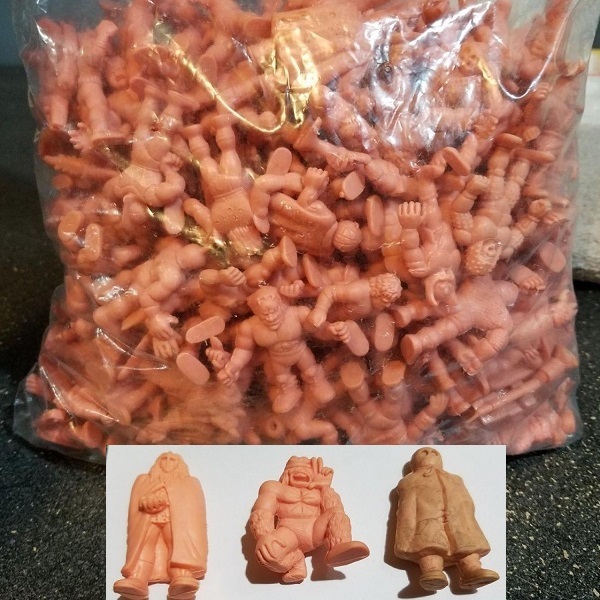 The ring figures also appear to be in their original plastic prison. The ring is also in surprisingly good condition. I’m always shocked when the clasps don’t have white stress marks or cracks. All of those things, plus the confusing poster almost made me purchase this lot. What is that poster? 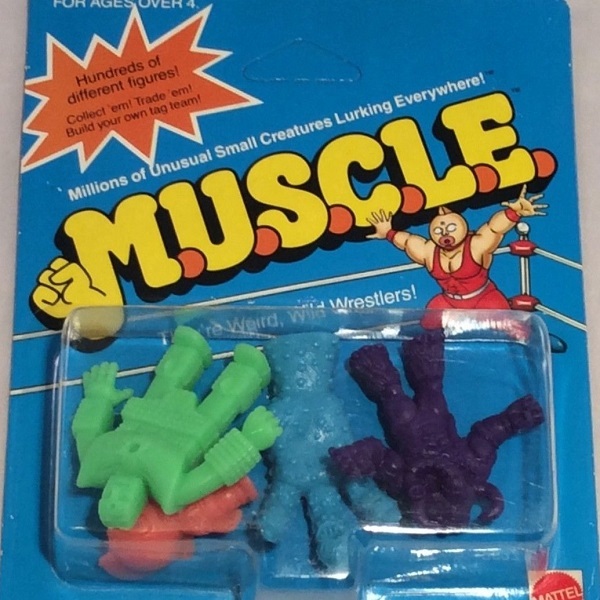 I’m 97.6% sure it isn’t a M.U.S.C.L.E. poster. I didn’t want to take the $49 gamble because I don’t need yet another ring. And do I care that much about the plastic wrap? No. After getting very excited by the previous wrestling ring, I nearly vomited when I saw the next listing. Up for auction is a very cool vintage lot of muscle men and a somewhat rare wrestling ring. Ring is in good condition with nice stickers. Perhaps the worst part of this lot is that it has some cool figures. The ring is essentially garbage. While some of the figures are cool they aren’t worth spending $44.99. This means they are stuck in some greedy seller’s hands. The fifth auction, The wrestlers lutteurs muscle men, is perfect. 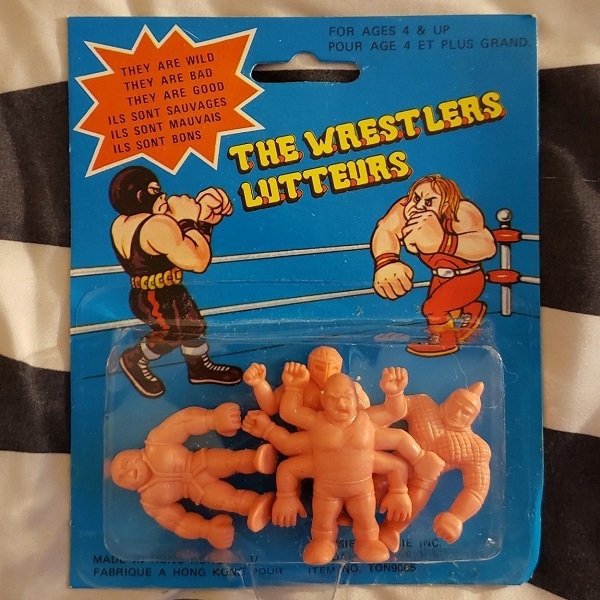 The Lutteurs are an odd little footnote in the M.U.S.C.L.E. story. The last package sold for $61. I am still shocked there were five bidders. Before that another one sold for $36 it had seven bidders. These types of oddities need to start at $1. They need to pull bidders into the mix. I think it’s just the nature of this type of item. It pulled me in, but I can’t imagine getting sucked in too deep. Of course this is coming from the guy that nearly bought his fifth wrestling ring because there was white cardboard and plastic for $50. Maybe I don’t know what I’m talking about. Maybe I’m already sucked in. This entry was posted on Tuesday, October 2nd, 2018 and is filed under Auction Watch, UofM News. You can follow any responses to this entry through RSS 2.0. You can skip to the end and leave a response. Pinging is currently not allowed.